I first posted this recipe back in 2009. It sounds... interesting, but to date, I still haven't made these. 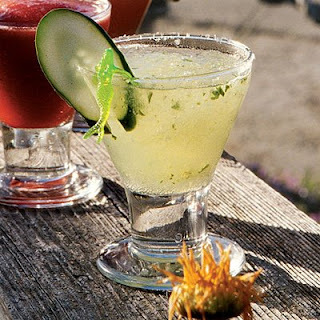 Originally I got the recipe and put it in my files back in 2005 when I saw it in Coastal Living but even though I really, really like cucumbers, I just can't get myself to drink them. Silly, I know. I am wondering if any of my readers have made these? If so, please let me know what you think!! Since last year, this is one of my favorite ways to eat cooked cauliflower. Originally I got the original idea for this one from Dana Carpender's book but she also used rice, and Vege-Sal so I started to tweak it and ended up with a dish that became a favorite. It's very quick and easy and the flavors work together quite well. I still continue to 'tweak' it. Two weeks ago I made this using cabbage instead of cauliflower. Very good! I made it twice this way. The first time was to use up a partial bag of shredded cabbage mix I had bought to make cole slaw. I just poured in what was left in the bag and cooked it as usual. Very, very good! So good in fact, later that week I used a head of fresh cabbage, chopped it up and made a small version of this recipe for my lunch. Last night I made this dish again - this time using raw cauliflower pieces - but it was not ran through the processor. It was just cut in bite sized pieces, and I added about a cup of shredded cabbage for a cauliflower/cabbage mixture. Again... a hit. So use cauliflower, cabbage, or a mixture of both. So good! Feel free to halve this recipe or just estimate the amounts you wish to use based on your preference for the amount of bacon and onion. This is the recipe I said on Twitter I wanted to 'get around' to posting but life was getting in the way! This morning I have my coffee in hand and am determined to get it typed out. This is an interesting recipe to me. Mainly, because it's basically like most low carb and sugar free cakes that are loosely based on the traditional Red Velvet, however this one had no butter in it. Instead, it uses 1/3 c oil and 1/2 cup sour cream. I pondered that for awhile when I was mixing it. I even debated putting in a 1/2 cup butter instead of using oil; because frankly, I have never made a Red Velvet Cake in 30 years that I didn't use butter as the main source of fat and I have never seen a true Red Velvet Cake that used oil. In the end, I went with the oil and didn't improvise that - although I did improvise a few other things. I always do. I hope you do too - play with your food. Make it your own. My opinion of this recipe is that it makes a very, very delicious cake. It does not have the traditional Red Velvet flavor that it should - but I think that is because bakeries, Sam's Club, Costco and companies like Pillsbury and Duncan Hines have ruined the name Red Velvet by releasing products that are little more than chocolate cake with a lot of red food color in them. The flavor of those products are not Red Velvet Cake. But I digress. This is a very good cake that is just a smidgen under what I would call "milk chocolate" flavored. But good none-the-less and worth making again. Grease 2 round cake pans. Flour with almond flour or oat flour. Preheat your oven to 325. In a large bowl whisk or stir the dry ingredients; oat flour, vital wheat gluten flour, almond flour, cocoa powder, baking powder, splenda and Erythritol and salt. Set this aside. In another bowl whip the 8 egg whites to soft peak. Sprinkle in cream of tartar and continue whipping on high until stiff peaks form. Set aside. In another bowl mix the cold water with the 4 egg yolks. Add oil, vanilla and liquid sweetener. In a small cup or bowl, mix the sour cream with 1 T vinegar and 1 t baking soda. Add the food color to this and stir well. Mix this sour cream mixture into the egg yolks. Mix the sour cream/egg mixture into your dry ingredients and beat. Add 1/2 of the whipped egg whites to the bowl and beat about 1 minute. Add the last half of the egg whites but fold in by hand, with an 'over' motion to incorporate the egg whites but not break them down. Divide batter into 2 cake pans. Bake 20-30 minutes until they are done in the center. Let them cool 10 minutes before removing from pans and cooling complete. Use your favorite sugar free frosting to fill the center and frost the tops. I chose a frosting that used egg yolks in it in order to use up 2 of the leftover 4 yolks from the cake ingredients. If you wish you can use this one too. In a microwave safe bowl beat the egg yolks and Erythritol. In a small cup or bowl mix the cream with the splenda. Slowly pour this into your egg yolk mixture, whisking well by hand. Microwave this mixture 1 - 1 1/2 minutes, removing every 30 seconds to whisk well. When it's very hot and small bubbles are formed in the mixture, stop cooking. (Do not overcook! Also, do not cook the entire 1 1/2 minutes without stirring or you are liable to get scrambled eggs.) Whisk smooth again and set aside. In a mixing bowl, beat the butter until smooth. Slowly drizzle in the liquid mixture down the side of the bowl into the butter while continuing to beat. Add vanilla and liquid sweetener to taste. Frost your cooled or chilled cake. This freezes well. Revisiting the healthy, sugar free, wheat free, chocolate chip cookie! Since my recipe blog has been around since 2006, I've posted this before, but I decided to re-post because I truly think this recipe tops all of the restaurant cole slaws I've had. I had a chance to compare again, as I had a couple bites of a very good cole slaw last night with dinner when we ate 'out' for Mother's Day. Since I'm not doing sugary foods right now and cole slaw traditionally has sugar in it, I only opted for 3 bites; enough to compare the restaurant version to the one I make at home. My homemade version won. Any time I need to prepare a side dish for a bbq, event or summer dinner and want to make cole slaw, this is the recipe I turn to time and time again. Since the mid 1990's this is my all time favorite way to prepare cole slaw. It's very similar to the taste of KFC's or Long John Silver's versions and just so good with everything from BBQ to Burgers, from Fried Chicken to Fish... well, anything! You can use a sugar substitute of your choice instead of sugar and if you do not have buttermilk, you can sour 1/4 cup milk with a bit of lemon juice or vinegar and let it set until the chemicals react and you see it get thick. Also, if you want to skip chopping the cabbage, you can buy the cabbage/carrot mixture pre-packaged at the store to equal about 6-7 cups of shredded or finely chopped cabbage. It will be dry at first mixing but after it chills for 2 hours it will have formed its own juice. Stir well and serve cold. PLAY with this recipe. 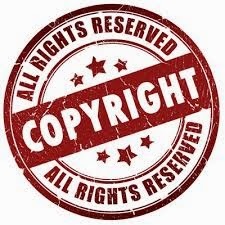 Low carb and sugar free recipes work completely different for people based on the exact brands used, temperature outside, humidity level, etc. This recipe started out to be a Twix recipe - but the caramel I wanted to make didn't work so I switched it up and ended up with this instead (more on that below). I used Xylitol and Erythritol because I was trying to make caramel initially but you can certainly use all of one and not the other if you wish. If it's just a little too dry add a little splash of heavy cream. Too moist? Isn't a problem unless it won't hold shape, in that case, add some confectionery texture sugar substitute or a little more vanilla whey powder. Again... play with it a little if you need to. In the full sugar version of my Salted Nut Rolls, you use powdered sugar, marshmallow creme and bagged caramels. For a sugar free version I tried to make a sugar free caramel from a recipe using Xylitol - which I was pretty sure wouldn't work - and it didn't. I know Xylitol has no crystallizing properties so getting a nice warm, brown, thick, caramel from it was going to be tough, but I was willing to try. It didn't work but I was relentless in my quest so I tried again. No. Xylitol will not make caramel and I admitted defeat. I ended up flipping through recipe files until I fell upon a homemade Snickers candy bar and then adapted the filling to that, played with it a bit and ended up with a Salted Nut Roll! Individually the ingredients weren't that special but together? Tastes almost exactly like the store bought Salted Nut Roll candy bars. YUM!!! Divide the dough evenly to about 16 pieces. You can roll them into circles, small 2 inch long logs or shape into squares. Place them on wax paper or parchment, refrigerate again while you prepare the caramel and nuts. In one bowl, place about 1/2 of the jar of caramel topping. I use the topping in the glass jar sold by the ice cream toppings and not the syrup sold in a bottle by the chocolate syrups because the ice cream topping version is thicker. If you use the syrup it's going to be thinner, more runny, more messy and you won't have a layer of caramel - but they will still taste really good anyway. Place the nuts into a baggy and hit gently with the edge of a rolling pin to barely crush/chop the nuts. You can use a processor, but be sure to barely pulse as you don't want them 'fine'. Place these into a 2nd bowl. Remove the white center dough from the refrigerator and using your fingers (messy) or a fork, dip and roll in caramel, then roll in nuts and then place on wax or parchment. When you are done with all the pieces you can either serve as is, or individually roll them in bits of plastic wrap to store. Keep these in the refrigerator or freezer. They don't freeze solid in the freezer so that is where we keep them. Amaretto Almond Cake - And the Sugar Free Amaretto Almond Cake Version! There must be something about the month of May that makes me crave this cake. 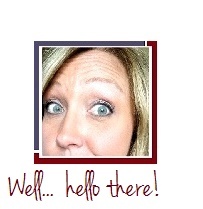 I knew I had posted this recipe once before and sure enough, I found it in May of 2010! This is a cake everyone who tastes it, seems to love. As a matter of fact, one of my daughter's friends loved it so much she took half the cake home once! This time around my craving was in vain, as we are currently doing no sugar and lower carbs. But a craving can be given into if you find a way... right? Well, I did. Perhaps not the greatest way, but a huge improvement as I adapted it by making it sugar free and 'lower' carbs - although still not officially a true low carb dessert. It could be - if I ever tweak a low carb yellow cake recipe enough to use, but so far I don't love love love any of the yellow cake recipes enough to try it on this one. So I opted for the store bought Pillsbury Sugar Free Yellow Cake Mix which still has 34 carbs per serving but at least it's sugar free. I left out the amaretto liqueur due to the sugar content and instead, doubled the water and almond flavoring. The pudding was sugar free of course and in the glaze, I used granular Erythritol instead of sugar. (Erythriol, sugar free cake mix and bundt pan links to purchase from Amazon below the recipe if you are interested). 13 Dip or Appetizer Recipes just to Get you Started! Cinco De Mayo! Got last minute guests coming for a drink and/or appetizer? Since 2006 I've posted about a hundred appetizer or dip recipes that you could use. I grabbed a random few dip recipes to post here to make it easy to glance through the list and see if there is something that looks good to you. If you want to dig a little deeper, feel free to use the labels for 'appetizers' on the right hand sidebar. At the end of the page just hit "older posts" for the next page. Here is a dish that is ever-so-popular at almost any get together... and there is a good reason for that. It tastes good. People like it. It's SO fast and easy to throw together - it's good to keep a can of refried beans on hand 'just in case'. I have made this numerous times and of course - use what you have on hand and improvise if you know your family or friends don't like something. Spread the beans on a serving platter or covered pizza round and top with rinsed and drained black beans. You can bake at 325 degrees for about 10-15 minutes now - and top with the rest as a cold topping OR finish layering the ingredients (sour cream, onions, lettuce, salsa, cheese, tomato and olives) and heat it all. Serve with sturdy tortilla chips. Last year at this time I wanted to share with everyone this recipe that was ALL over the internet, but I found it and linked from the SheKnows site ( Pinata Cookies). 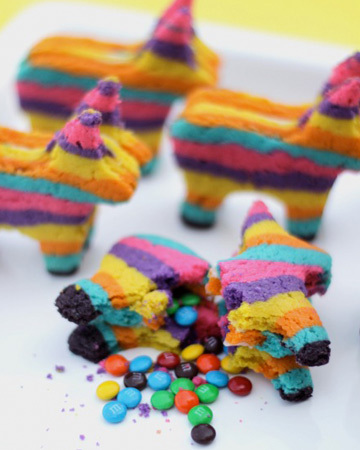 I wanted to share it again this year because I just happen to think it is the coolest Pinata Cookie ever! If you by chance haven't seen the M&M stuffed cookies, they are a multi-colored sugar cookie with a second for the back side and sandwiched in between them is a third cookie with the ears and feet cut off and used to hide the goodies inside. Cover the layered dough and freeze for four hours or overnight. Create the hidden pocket. For the middle cookies in each set, cut off the ears and legs, and cut out the center where the M&M's will go. I used a small square cutter, and made three cuts to get a narrow rectangle. Try to work quickly, because as the cookies cool, they are more likely to crumble or break. Let them cool on the baking sheet before you move them and remove the excess, outer cookie. Put the middle cookie on top of the frosting glue and add the M&Ms to the open center. 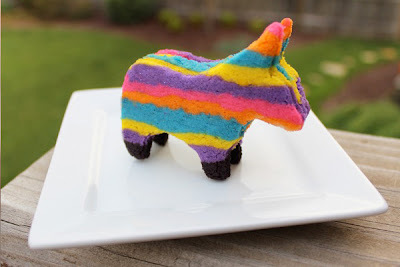 Put another outline of frosting glue on the middle cookie and place the opposite-cut piñata cookie on top (so that the pretty side is facing out). Let these sit and harden for at least 30 minutes before you stand them upright. This recipe will make six to eight piñata cookies.